Watch the video: He was the nation's first public enemy number 1. 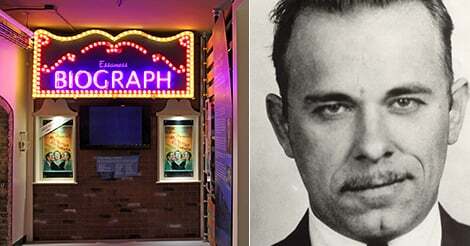 Now John Dillinger is the focus of a new museum in Northwest Indiana. Armed with a fake wooden gun, the infamous gangster John Dillinger made a daring escape from the Crown Point County Jail in Northwest Indiana in 1934. Now, more than 80 years later, Dillinger has returned to Crown Point. The new John Dillinger Museum opened last week at the Old Lake County Courthouse and features a number of Dillinger artifacts, including the wooden gun he used in his dramatic jailbreak. Joining us to talk about the new Dillinger Museum on Chicago Tonight is Speros Batistatos, president and CEO of the South Shore Convention and Visitors Authority, which oversees the museum. The John Dillinger Museum includes a number of items associated with the infamous, Depression-era gangster. The fake, wooden gun Dillinger used in his daring escape from Crown Point County Jail in northwest Indiana is featured along with a number of replicas of guns used by the dangerous Dillinger gang. The museum also has one of many "death masks" of Dillinger’s face. These plastic molds were made after FBI agents gunned down the bank robber outside Chicago’s Biograph Theater on July 22, 1934. According to the museum, so many death masks were made that Dillinger’s skin and hair were damaged. FBI Director J. Edgar Hoover owned one of the death masks and displayed it outside his office. The museum also owns Dillinger’s original tombstone, which had to be replaced in 1958 after fans chipped away much of it for souvenirs. It’s on display next to a wicker casket used to carry Dillinger’s body from the Cook County Morgue to his final resting place in Indiana. Hours: 10:00 am-5:00 pm Tuesday through Sunday (last admission at 4:00 pm); closed Monday. Admission: $4; $3 for seniors ages 50 and older; $2 for kids ages 6-12; and free for kids under age 6. Location: Inside the Old Lake County Courthouse, 1 Courthouse Square in Crown Point, Indiana. See a timeline of highlights from Dillinger's life.